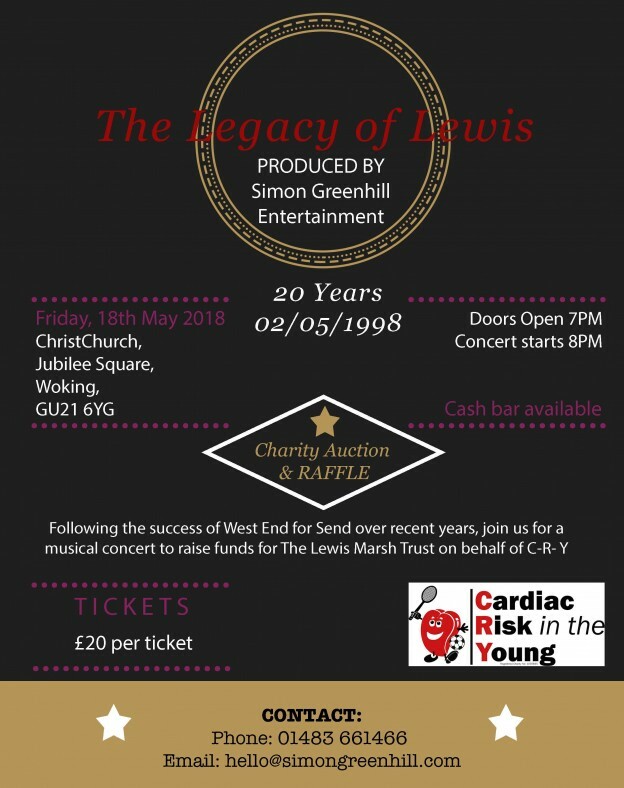 Chobham member Simon Greenhill will be holding an incredible west end musical concert at All Saints Church, Woking on Friday 18th May, to celebrate the Legacy of Lewis, beloved family member who unexpectedly passed away from an undiagnosed heart condition 20 years ago. Simon’s family have been great supporters of CRY ( Cardiac Risk in the Young ) and are asking for your support. Tickets are modestly priced at £20 each and we would love to see the venue full to the rafters. Tickets are limited and are going very fast, so please email hello@simongreenhill.com or call Ray Wilson on 07831 578490 to reserve your tickets. The evening will consist of leading men and women of London’s West End performing hits from our best loved musicals with a few surprises thrown in. There will be a Rugby theme with lots of raffle and auction prizes donated by Saracens, Exeter Chiefs, Harlequins, and St. Austell Brewery and The Sporting Wine Club have donated a few barrels and bottles between them to keep everyone nicely refreshed. The money raised on the evening will be used to fund a weekend of heart screenings for juniors at Chobham Rugby Club on 12/13th January 2019. Each screening costs £50 each and we will be screening 100 people at a full cost of £10,000.